Yesterday, S and I decided to be among the first folks in Sillypore to try Wild Rocket. I should state that visiting a restaurant on its opening day is the kind of thing professional food writers usually try to avoid. No matter how hard a restaurateur and his team have prepared, there are always bound to be some small problems in those first few, frenetic and very stressful weeks. But since we weren’t visiting Wild Rocket for any other reason than this blog and, of course, to support chef-owner Willin Low, we went anyway. The restaurant is cute. It’s very airy and casual, the kind of place you can go in shorts and flipflops or in Prada and a pair of Louboutins and not feel out of place. The menu is small, offering just a few choices for starters, pastas, mains and desserts. That said, all of the choices looked good and we had a hard time deciding what to try. In the end, we ordered the cauliflower cream with crabmeat soup, the laksa pesto spaghetti with quail’s eggs, seared ribeye with wild rocket and sweet potato, profiteroles with vanilla ice cream, and a strawberry cheesecake with maple walnut ice cream–and shared everything. The soup (pictured above, being eaten by S) was good. But I have this theory that cauliflower creams are best served cold. When chilled, the cauliflower taste comes forward. When hot, it becomes almost too subtle. This soup is served hot, which while tasty, thus didn’t taste all that much of cauliflower. It really depends on what your personal preference is. The crabmeat was a yummy touch, though. 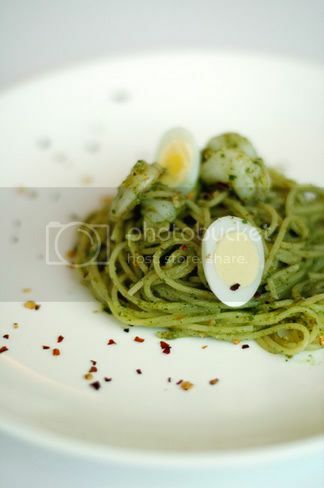 I really enjoyed the laksa pesto spaghetti. (Note that pictured above is a half portion.) The pasta was cooked perfectly and the pesto had a great fresh herb flavor. The dish also had just the right amount of spice. S really wanted to try the seared ribeye (again, the picture is of a half portion), and I’m glad we ordered it. It was extremely juicy, flavorful and cooked just right. While I would have loved a side dish with some Bernaise sauce or, my own favorite steak topping, some coriander pesto, the steak was more than able to hold its own unadorned. The sweet potatoes–I think they were either pan-fried or oven roasted–were excellent. They were crispy on the surface and soft and sumptuous inside. Overall, it was a good lunch. The service was excellent. We each had a glass of the house white, a sauvignon blanc, that while a tad green at first went very well with the food. The prices are also pretty reasonable, somewhere akin to those of Blood Bros Project Shop café. Over the next few weeks, the standard should improve. We did, as mentioned at the start, go on the worst possible day for evaluating any restaurant. I, for one, intend on heading back again soon, both in the evening to see how the restaurant looks at night and also for Sunday brunch; they showed us the brunch menu and it looks absolutely yummy. So, if you’re looking for a reasonably priced, simple meal, please check out Wild Rocket. It’s a nice, casual owner-operated restaurant. And, like any young business, it needs your support to survive. 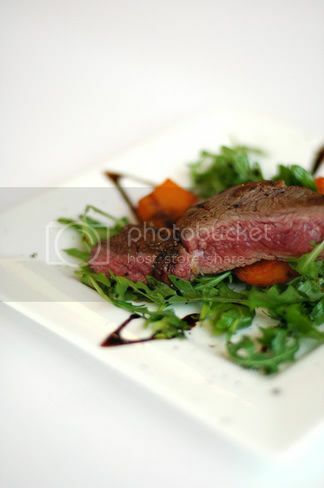 I like the sound of Wild Rocket – it seems the premise is to provide good quality food which is accessible to everyone. I hope they have a succesful opening year. Food looks great although I’m sure that you could make yesterday’s soggy leftovers look tempting with your stunning photography! Oops! I mean I DIDN’T catch the laksa pesto spaghetti part. Haha! U sure do not fail us huh? U beat me to visiting the new haunt. I would like to try the Strawberry Cheesecake thou. It looks YUMS! And also the Laksa Pesto Pasta too. Wild Rocket sounds like the perfect casually elegant dining experience. I love the sound of the food, and the plates looked lovely. I’ll admit, I agree with you – I love a steak with some bearnaise on the side! We didn’t exactely met, but I just launched a new meme, a kitchen meme, and I would be very pleased if you wanted t participate. All details, in english also, on my homepage! Wow! It looks delicious. I am thinking of going there for an anniversary celebration. What’s the damage like for say 3 courses per person? I think I’ll go there on the dessert alone! The strawberry shortcake in the parfait glass looks terrific. What a lovely way to present the dessert. PS. Congrats on winning both the Aesthetics and Eatability crowns in DMBLGiT! Great shots as always. Always masterfully done. Hey congrats on your win in the DMBLGiT. I knew these madeleines were winner when I first saw them on Flickr! tabehodai: I usually make my pesto with the usual ingredients, basil, olive oil, pinenuts, garlic, parmesan, and often add a bit of coriander. I think the trick is good quality igredients, i.e. fresh basil, young garlic, good extra virgin oil, real parmesan, etc. Saffron: Me too. Actually, I’m bringing a group there tonight and hoping they’ll all like it. Slurp: laksa leaves and chili in the pesto sauce. Cindy: Hey, I’m still waiting for your report! When are you going? Tara: I’m a real suace person in general. Bernaise, mushroom sauce, tomato-chili relish… I like having such things with which to add extra oomph to my food. Cenzina: Hi, just saw the meme and will do it the weekend! Cheers. Bourgeois Babe: My lunch for 2 of us, 1 app, 1 pasta, 1 steak, 2 desserts and 2 glasses of wine was S$75. Apps are under S$10. Pasta is around S$13-$17 and mains S$20-$25. Hope this helps. 2-Minute: Yah, we’ve been think of deconstructing one of Claudia Flemming’s desserts and serving it in a martini glass from now on. 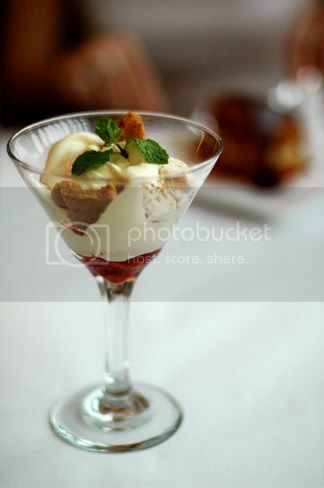 Hi, I’m always amazed at how great your pictures are when you dine out! The meal looks fantastic, and now I definitely have a craving for cauliflower soup. I’m interested to try your tip for eating it cold, as I’ve only ever had it warm. You should try Testsuya’s cold cauliflower soup with caviar recipe. It’s delicious. Thanks CH! Now the challenge is to find those ingredients in the land of the rising sun. What beautiful presentation. I like it! Lovely review too, very balanced and honest. I visited last night and have to concur that the strawberry cheesecake was spectacular. Too bad my dinner companions weren’t as enthused (they preferred the chocolate cake). I’d go back for the cheesecake alone! Hi Cour Marly, I’m really glad you took the time to check Wild Rocket out! They do whip up a good version of the molten chocolate cake. But after having been served that same kind of cake in every other restaurant/cafe/takeout joint in Singapore (c’mon it’s been almost a decade since it first made its debut on our island), I’m honestly sick of it. This is my personal tirade, but molten chocolate cake cannot be the be-all-and-end-all of all desserts. Please encourage our pastry chefs to get back to being creative in the kitchen by refraining from ordering molten chocolate cake! It drives me equally nuts when they call it something else, but when it comes to the table, it turns out to be the same eggs-with-equal-parts-butter-and-chocolate-hardly-any-flour-but-lots-of-sugar filled, mushy centred dessert. So, woohoo! I’m so happy that you approve of the deconstructed cheesecake. S, I was using the very same argument with my friends! I said that one could get a decent molten chocolate cake at other places but certainly not that lovely cheesecake. Say No! to culinary homogenisation! Really loving the photos here, as always. Just one question: how are you able to get such good light? Short of bringing a klieg lamp, I can’t imagine having such bright lighting in most of the restaurants we’ve visited. What’s the secret? Hi Nosher, actually, I went to Wild Rocket for lunch and took these using daylight. But for other restaurant pix, I usually shoot at iso 1600 and adjust the white balance using a white napkin prior to shooting. I will the even stop up the picture +3 or +7. It helps when your camera can do all this and I adore my D70. Anonymous: That’s fantastic that you had a great anniversary dinner. Congrats.